My ex-wife is missing out. We all have self-imposed blind-spots, if you will. I'm using my ex-wife as an illustration, in order to point out an error we may all be committing in our daily lives. She enjoys many different kinds of TV shows and movies, for example, she is a fan of C.S.I. (any of 'em) and cop shows in general. She has nothing against a shoot'em up action movie like Die Hard. One of her favorite actors is Clint Eastwood. That said, she has imposed a rule in her mind that limits her enjoyment...she will not, ABSOLUTELY NOT, watch a movie featuring either of the following: War or Boxing. Period. A few years ago I bought the DVD "Million Dollar Baby", starring Clint Eastwood, her biggest hero. She refused to watch it, to this very day. Why? Because it has boxing in it. It didn't do any good to inform her that Clint not only starred in it, he also directed it and it won several Oscars, one for direction, one for best picture, and co-stars Morgan Freeman and Hillary Swank each won Oscars for their performances. I could not change her mind. Which is hugely tragic, in my opinion, because while she is trying to filter out whatever she finds unpleasant regarding these 'genres', she does not realize what she is missing. Most 'war' movies for example are not trying to condone or glorify killing or warfare, that is merely the setting of the story. The story is what is important, not the setting. The story isn't going to be about how wonderful killing is, but how we as people deal with events like war, tragedy and death, cowardice and courage. There are giant lessons to be learned, and by closing off that doorway she will never understand some of these things as well as she could. Don't let misconceptions prevent you from experiencing the lessons that life has to offer...in regards to comic books, don't be afraid of certain genres because they are unfamiliar to you. Guys, go look at an old Romance comic, you'll find something worth looking for. Ladies, don't fear War comics, there is real heroism and history, and much to learn about ourselves and the world around us. There. All that was said is to preface my real point -- Harvey Kurtzman was a genius who contributed more to the comics we know and love than we can really understand. Harvey Kurtzman (October 3, 1924, – February 21, 1993). Harvey Kurtzman was an amazingly talented fellow who was responsible for creating MAD as well as the finest War comics ever produced. 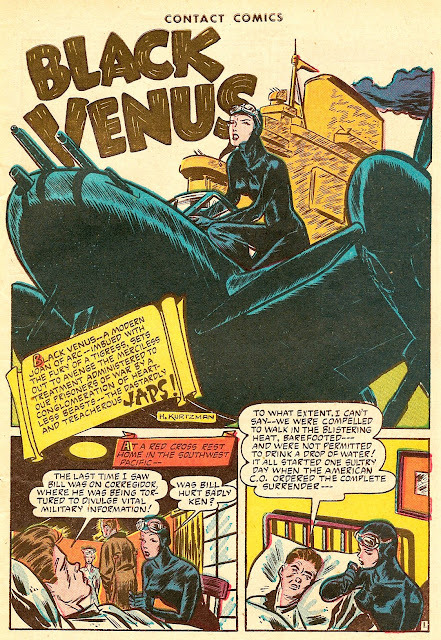 He was already writing and drawing his own type of comics by the time he joined the ranks of EC Comics in 1949. 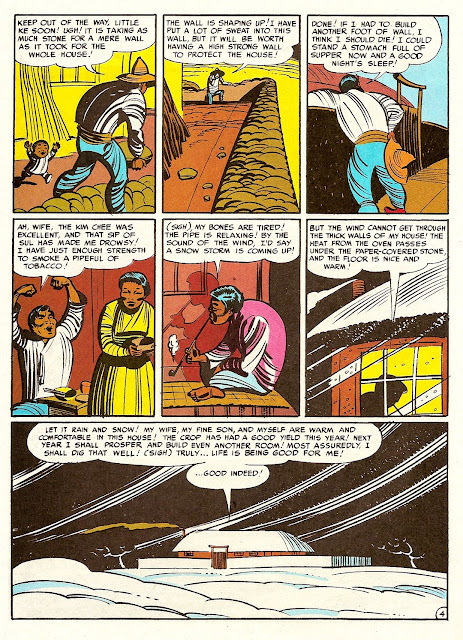 In 1950 he began writing, editing, and laying out every story for TWO-FISTED TALES, as well as drawing stories himself as well. In 1951, he added FRONTLINE COMBAT to the list, and in 1952 his unmistakable brand of humor emerged with the first issue of MAD. 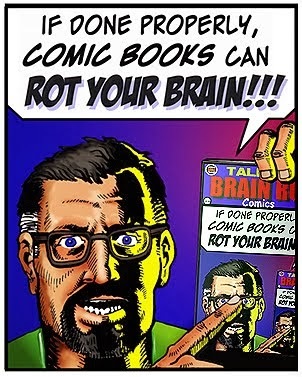 Comics have never been the same since, and thank God for it. 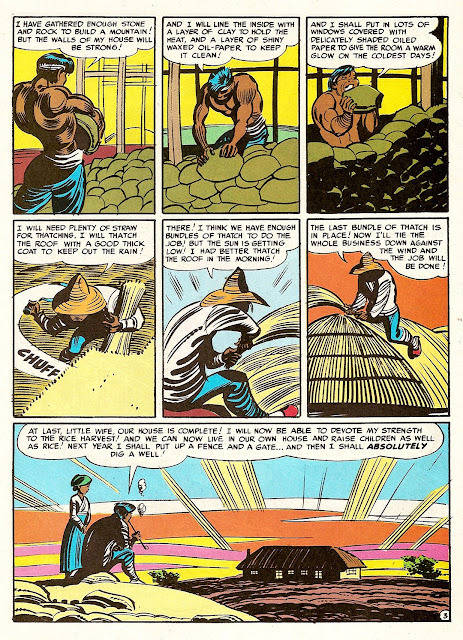 "I personally like Kurtzman's work even more than the Mad artists he supervised. 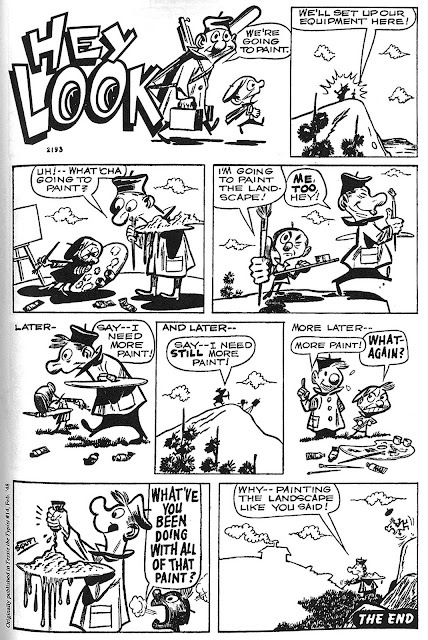 Kurtzman did the layouts for most of the Mad (and E.C) comics. In other words, he drew quick compositions in thumbnail form. 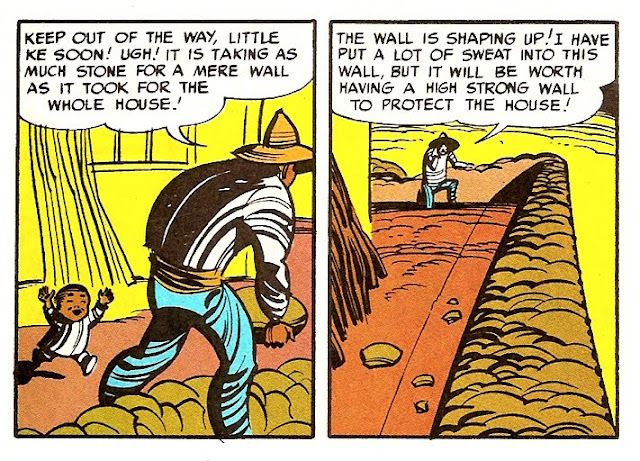 The artists lost a lot of the larger design element inherent in Harvey's work. His organized crowds became chaotic hard to read jumbles in the hands of the more famous cartoonists - in my opinion. 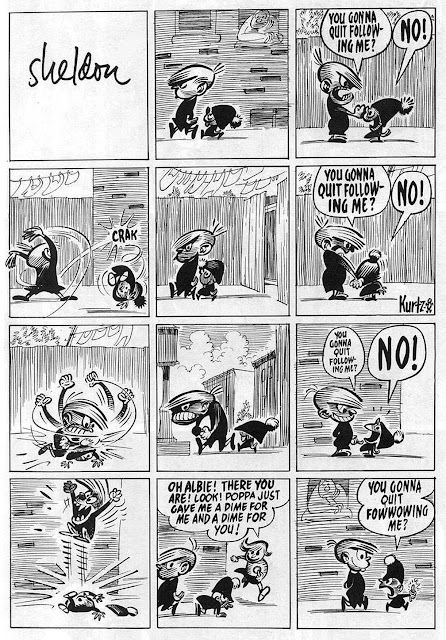 But one thing most fans are in agreement on: Wally Wood, Jack Davis, Will Elder and the bunch did their best work under Kurtzman's direction. Kurtzman is a rare creature that sees the big picture. Most artists get buried in the details. The fact that Harvey drew each character "simpler" than most artists makes it easier to see the composition and big picture and we can learn from that. It also makes beginner artists tend to think he is "primitive". Harvey thinks like a good animation director or a good short story writer." John K's summary of Kurtzman 'seeing the big picture' is certainly an accurate one. 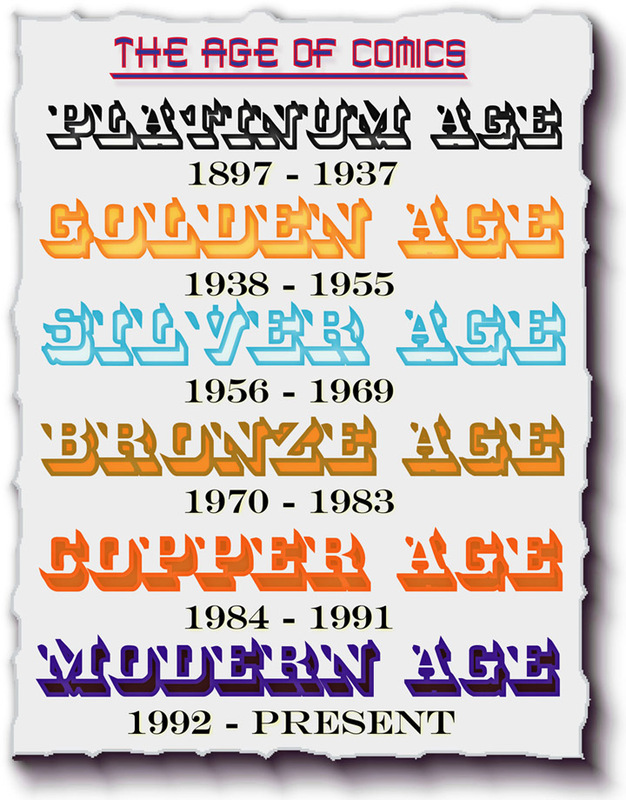 It took me a while to realize this myself over the years, as I initially brushed off his artwork as...amatuerish! Can you imagine? 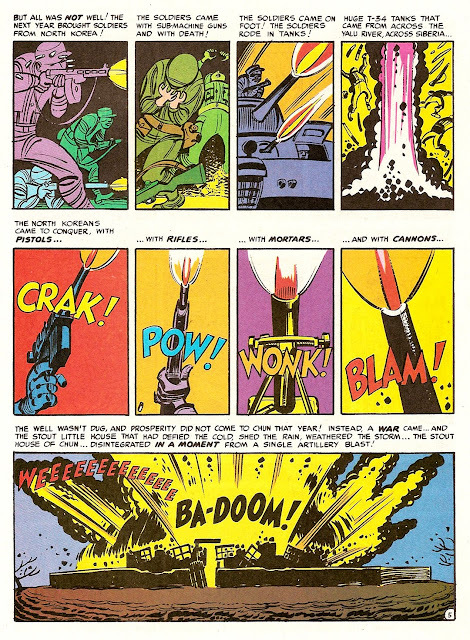 I was blinded by the glitzy tight finishes of the other EC stars, Wally Wood and Frank Frazetta and the like, and didn't realize how amazing and perfect Kurtzman's designs really were. 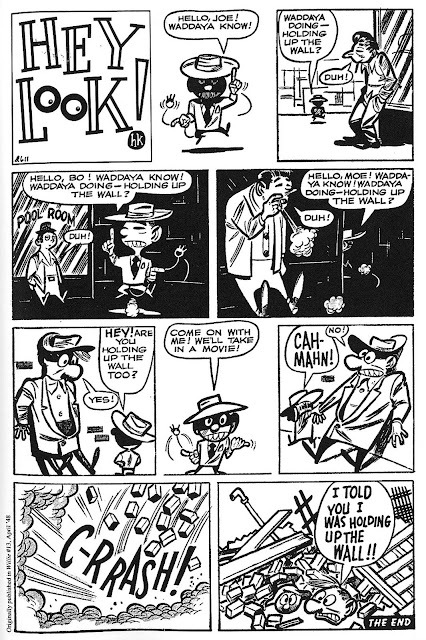 Kurtzman distilled every cover or panel down to it's most basic essentials, and never was there a figure or an object out of place. Everything was designed to get across his point. His figures are more like caricatures than real characters, but inevitably that is the basis of great comic book story-telling. 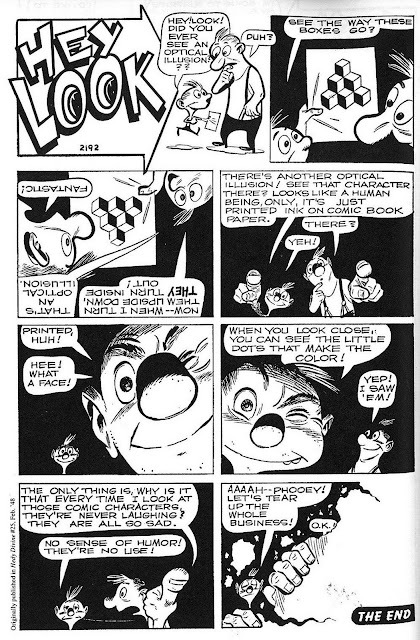 Here are a couple of wonderful examples of Kurtzman's brilliant ability to draw fluid. living, relatable humor stories (also taken from John K's blog). 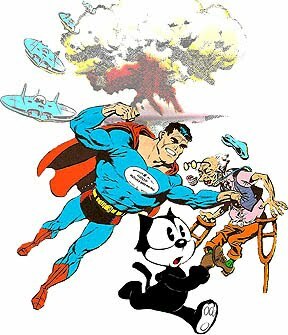 Now, how would someone like Harvey Kurtzman, with the supreme gift of humor, react to war? Why, he would hate it with every fiber of his being, naturally. "War is evil. No one wins. Why are we killing each other?" 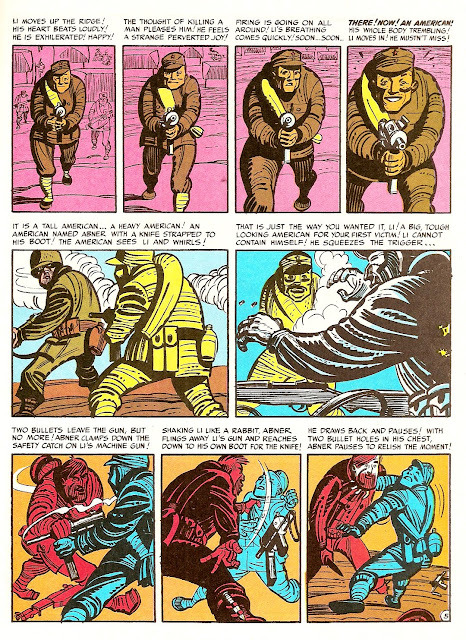 Kurtzman's genius established TWO-FISTED TALES and FRONTLINE COMBAT as arguably the greatest war comics ever produced. 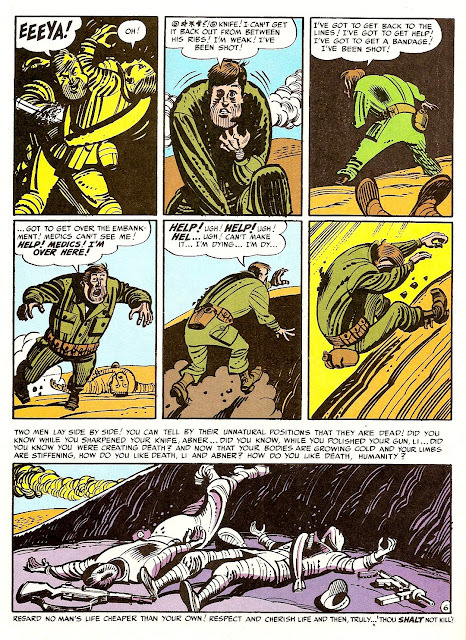 There were also the detailed and accurate historical recountings that Kurtzman supervised , but it was those fictional stories that most often revealed the tragedy and humanity that links us all together. 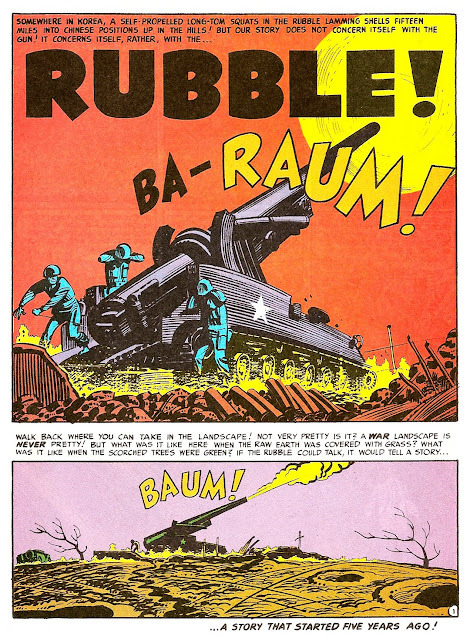 Here are two out of many brilliant Harvey Kurtzman war stories for your enjoyment. Take the time to look at each panel, and you can see how he laid each one out with apparent ease and genius to tell these unforgettably gripping stories. 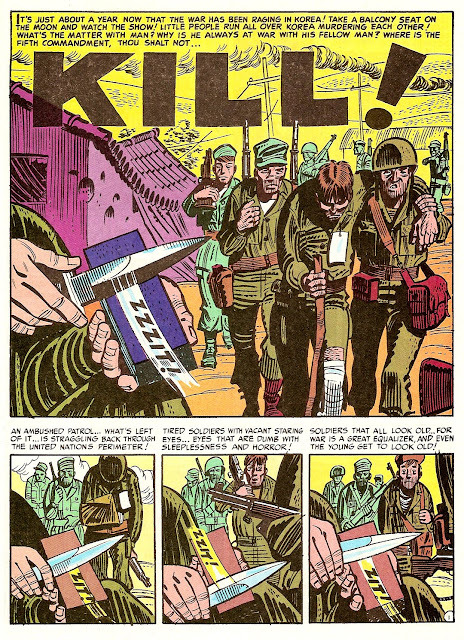 Kurtzman reveals the truth, that even if you get what you want in war, there are no winners. One of his most moving anti-war stories, "RUBBLE", tells the story from the point of view of a family who have the misfortune of trying to live their lives as war rolls through their country. Kurtzman bravely chooses to show our 'enemy' as a caring, loving human being with no thoughts of hate or war. We don't even have to participate in the war to be utterly destroyed by it. Was it our bombs that destroyed an innocent families home, or the enemies? 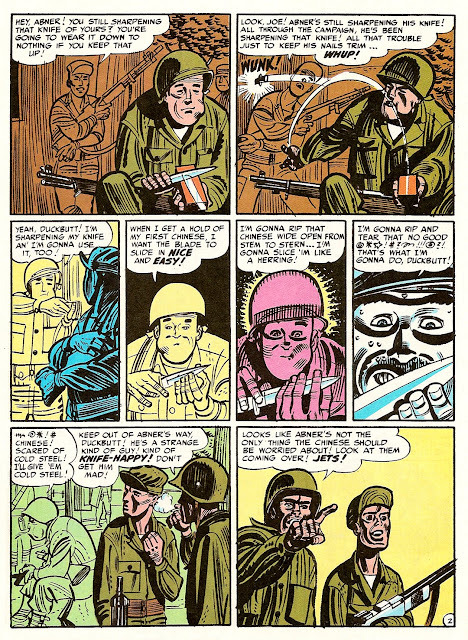 Kurtzman tells us point blank, it doesn't matter. When we fight a war, we are all guilty. 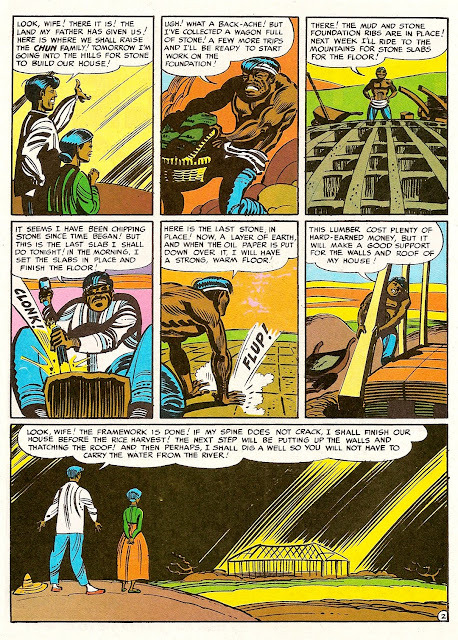 Mykal Banta has created a great blog featuring some of the greatest war comics of all time, by some of the best in the business. Make sure you drop in over at STAR-STUDDED WAR COMICS, you will find the best war-themed comic stories ever produced. 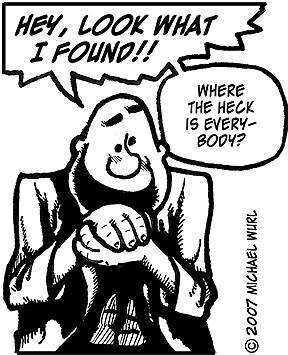 I will have more Harvey Kurtzman work to share in days ahead. 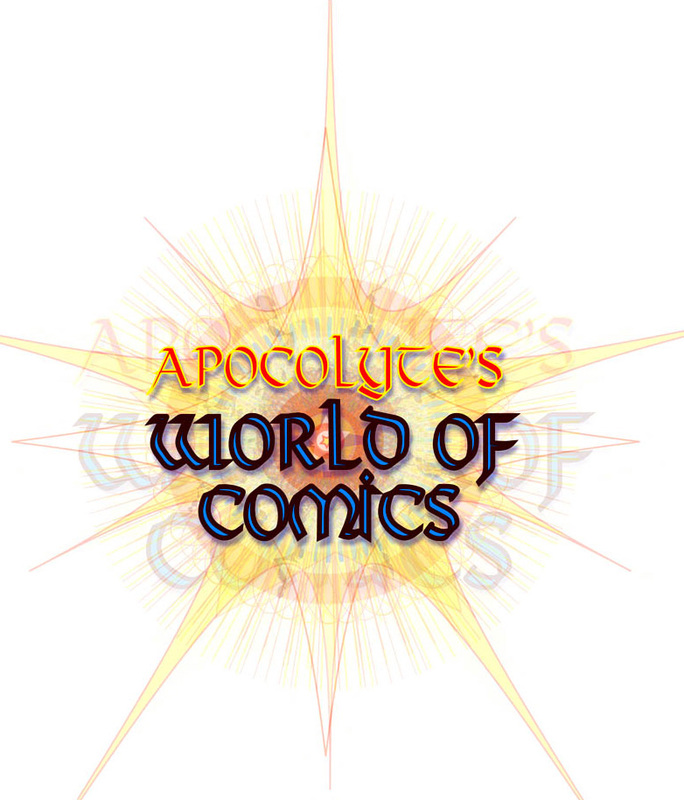 Apocolyte: Thanks for the plug! great collection of stuff! it's difficult to understand a woman's thought process, isn't it? does your wife like swordfight movies like Zorro? Kungfu movies? 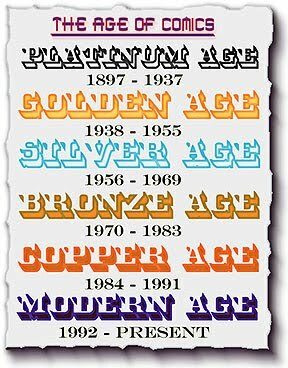 Like so many, I regard EC comics of the 50's as the finest of all time, due to the aggregation of talent they had assembled, and as much as I love everything done by Feldstein, Wood, Ingels, Craig, Davis, and the rest, (and I love them each for different reasons) Kurtzman's work holds a special place in my heart. If I was ever lucky enough to own an original of Kurtzman's, it would be the star of my collection (by the way, everyone, I do accept gifts...!). 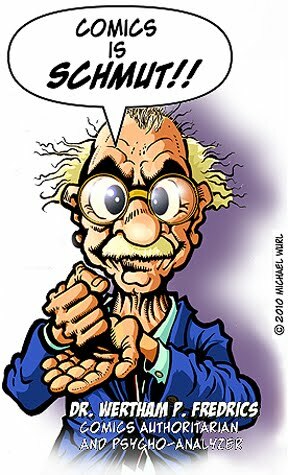 Echoing my comments above, while most people who know the name Kurtzman remember him as the genius with the crazy humor behind MAD, not all realize he was not just a one-trick pony. 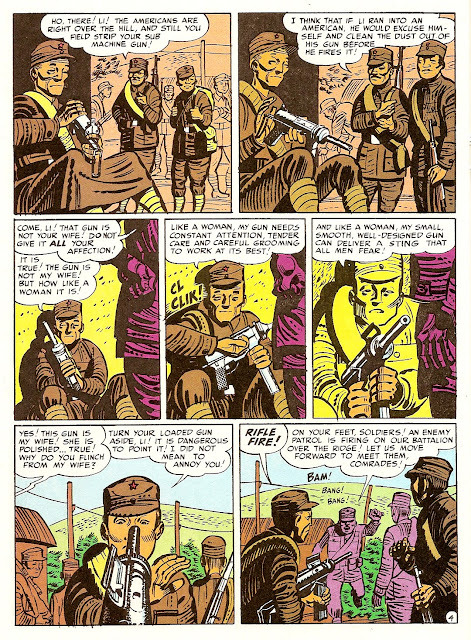 His War comics are some of the most beautifully done comics in history. Period. From the writing to the layout and final art, the epitome of the form. Incredibly talented! Now, as a talented artist yourself, what do you think of that Sheldon page of Kurtzman's? Don't you love the way he draws those characters, so elastic and full of life? He would have made a magnificent director of animated cartoons! 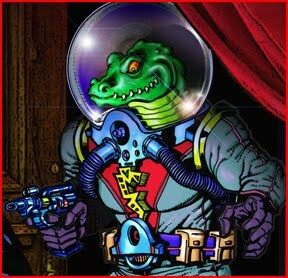 i am a huge kurzman fan, especially the stories he finished himself. such beautiful simplicity, and energy. love it! i can't wait for you to post more! These stories are mind-blowing. 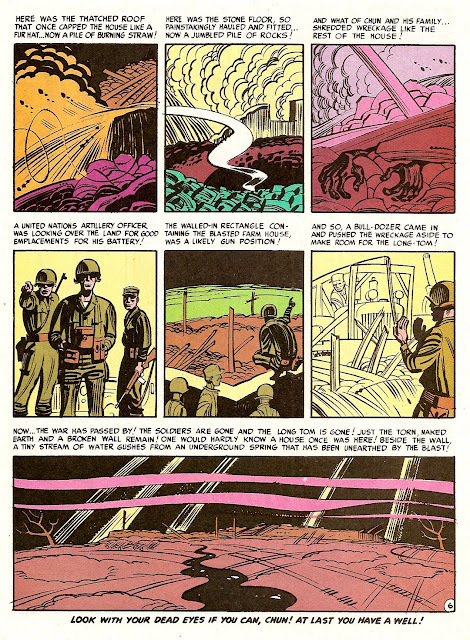 I wonder whether it was stories like these, that expose the reality of war at a time when the Government was heavily invested (pun intended) in conflict, more than people getting their eyes pierced or gangsters sharing their plans on how to rob banks, that fueled the McCarthyist war on comics and particularly EC. Well, is your wife committed to the notion that films with themes such as boxing or such as war are bad, or is she simply saying that, however good some of them might be, she won't pay the emotional price of watching them? Thank you, it's my pleasure. Kurtzman inspires many great artists like yourself to be even greater. More HK stuff coming up next! That's an interesting thought. 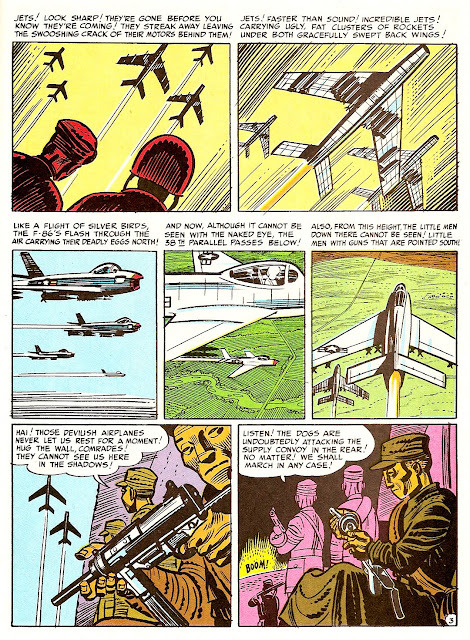 It's possible, but I think not, or at least I would hope thats not the case, since these type of war comics actually have strong underlying moral themes, and in my opinion, would be great lesson teachers for impressionable young minds, as opposed to the more obvious target of pre-code horror and violence. I just found your blog & I'll be back! Brilliant posts! Thank you! Most excellent!